STAKES. Holy moly! There were no stakes! And I don’t mean that my vampire hunter heroes forgot their wooden stakes. No, the problem was if my vengeful hero didn’t get her revenge… oh well. Shrug. No biggie. She’d survive. Though all the other points made by the above blog are spot on, like having a proactive hero with a goal, an absence of story stakes can be the revenge plot’s downfall. Beginner writers beware! But wait, don’t revenge plots inherently have high stakes like dangerous situations and even death? Yes, but putting your hero in life-threatening danger during their quest is a scene stake not a story stake. Every scene needs stakes (aka consequences), but the overall story needs ONE BIG CONSEQUENCE if the hero fails to achieve his goal. It doesn’t matter how many scene stakes you throw at your hero if the overall story stake is missing. #writetip Story Stake = What dire thing happens if the hero fails to achieve his goal? Note that story stakes must be dire enough to make the reader care. If all that happens to the heroine upon failing is she feels crummy, well, so what? In SAVE THE CAT, Blake Snyder explains that stakes need to be “primal”, such as survival, hunger, love, protection of loved ones, and death, to ensure that the audience is invested in the hero’s quest. I struggled against this advice. I mean, come on, does what’s at stake always have to be love or death or survival? So I thought about all my favorite books and TV shows and films, and oh my gosh, yes, the answer is a resounding YES. And the most common primal stake? Love. Even if the story isn’t a romance, even if it’s a life-or-death action flick, love is often a big story stake. This might be why most stories have a love subplot. But the love doesn’t have to be romantic. It can also be paternal or platonic. Just make sure your character cares about someone, then jeopardize that relationship or the actual life of that person to create or raise stakes. 1) If the protagonist fails, what happens? Would she lose a loved one, or die tragically, or get her heart irrevocably broken? Would her home be destroyed? Would evil rule the world? Something bad must happen if the protagonist fails to achieve her goal. 2) Is this the worst thing that can happen to the protagonist? What is your protagonist most scared will happen if he doesn’t achieve his goal? What would figuratively or literally kill him? Or both? 3) Are the stakes tangible? Will an actual action happen if the protagonist fails to achieve his goal? Will his lover dump him? Will he be sent to jail and separated from his family? Love, like all stakes, loses its power if it’s not connected to a concrete event. 4) Are the stakes worth fighting for? Your protagonist can’t “kind of” want her goal. Achieving her goal must mean everything to her! Failing would ruin her life! The protagonist can’t be ambivalent to the stakes. 5) Who else cares about the stakes? If only the protagonist cares, the stakes may be too small. Think about the other characters in the story. Do they care if the protagonist fails or succeeds? At least one should or else the protagonist might be a drama queen with trivial stakes. Stakes cannot be inconsequential. 6) If your protagonist succeeds, does she save the day? Avoiding the stakes must feel like a giant victory! Making readers care about your story and protagonist is difficult to pull off, but with primal story stakes it’s possible. Whether you’re a plotter or a pantser, figure out the stakes before you start writing, because without stakes, you won’t have a compelling story, and it’s best to find that out before you’ve written tens of thousands of words. Trust me. Hi Ms. Jackson. I’ve been reading your posts for a while now and they’ve helped me a lot. I’m writing a graphic novel and I’m still in the outlining stages. I have my protagonist deliver something in exchange for a cure for his condition. It’s fantasy, sci-fi ish. His condition prevents him from feeling anything (emotions, pain) and he’s sick of it. He also has a violent split persona. Thing is I dont know if these are REAL stakes. Would you please help? Thanks in advance. It sounds like you’ve set up an interesting situation that is ripe with stakes possibilities. However, I’m a little unclear on the goal. Is your protagonist’s whole for the whole story to deliver something in exchange for a cure for his condition? If so, great! Now you just have to think of some consequences to his condition, such as… Who else does his condition hurt besides himself? Someone in his family? A friend? Is he at risk of hurting someone important in his life? And if so, how exactly will those people be hurt. Of course, I see your issue — if your hero has no emotions, does he even care? But he must, otherwise he wouldn’t be “sick of” his condition. Hope that helps, and thanks for reading! Thank you so much for replying. I think the main objective might change by the end of act 2 or so. I’m not sure yet. At the beginning of the story he has no friends and he’s cold and calculated. He views people as stepping stones to his objectives. He meets all the other characters in the story and sees them as tools but during the course of the story he realizes what friendship is. He bonds with them. I thought this could be the vital character change you say is important. But I’m still stuck as to what “tremendously bad consequence” will arise if he doesn’t find the cure. The only idea I have is he hurt someone in his past and regrets it big-time. He hates how he is now. Could I make it something like “as he now acknowledges friendship he is scared again about hurting someone and his desire to cure himself is fueled”? Is it worthy motivation? That sounds like a worthy motivation to spur your main character toward his goal. 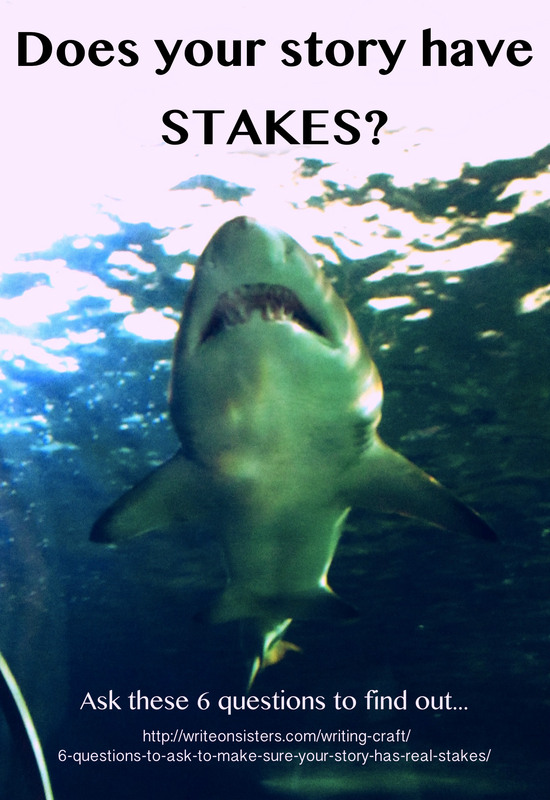 But you still need stakes, aka something he could lose right now. Ah. I see. Thank you Ms. Jackson. Also if I have writing questions do you mind if I reach you by email? I understand that you’re a very, very busy person but it’s really hard to find professional advice. At this time, I’m not working one-on-one with writers, but hopefully I’ll have time for that in the future! However, if you have a specific question, leave it in the comments and I’ll try to address it in an upcoming blog post. But note that the WriteOnSisters have Gone Writing until 2017. New blog posts in the new year! Great advice! We hear so often to “raise the stakes” that the term can eventually lose it’s meaning. Having tangible questions to ask helps determine what the stakes really are. So true! Thanks so much for the comment, Victoria! There are sooooo many things to think about when writing a novel! Maybe the stakes are there, but haven’t been brought to the forefront of the story. Though if not, you can always create stakes. That’s the joy of being in control of our fictional universes! Brilliant list of questions! I’ll be consulting these again before I go much further with the WIP!